The Jandy Pro Series Versa Plumb System delivers the highest energy efficiency through its innovative design that maximizes hydraulic integrity. With this system you will use a lower horsepower pump and less plumbing pipe and fittings, all while reducing energy consumption and installation time. The Versa Plumb System reduces hydraulic resistance by up to 50% versus other equipment sets in its class. The Versa Plumb System's increased hydraulic efficiency allows for up to a 1/2 HP smaller pump to achieve the same level of flow, resulting in greater energy savings. Fastest installation due to our pre-assembled plumbing kits, which enable quick and consistent equipment plumbing design to reduce installation costs. Innovative system design requires less plumbing pipe and fittings, while increasing hydraulic efficiency. Our heaters integrate the most advanced features for superior hydraulic integrity and a better user experience. Achieve a crystal-clear body of water with our complete line of Versa Plumb cartridge, DE and sand filters. Our innovative pump designs are at the heart of the Versa Plumb System, enhancing energy efficiency. 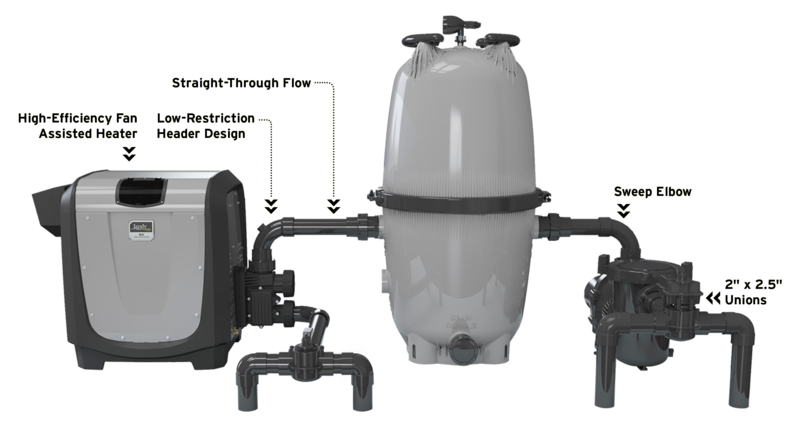 Jandy Pro Series offers a range of robust in-line salt water sanitizing systems to suit a variety of needs. Jandy Pro Series valves set the benchmark for quality and reliability. Integrated sweep elbows for maximum hydraulic efficiency. **Actual plumbing pipe color may vary.